A rare original owner boat, maintained by her conscientious owner, this 1997 40' Ocean Super Sport, named "Reel Slinkey" has several improvements over the years, but namely a lot of attention in the engine room (over $50k spent in the last year). Happily cruising along at 26 knots, the 40' Super Sport is quick yet efficient in a world where outboard center consoles are easily consuming more fuel as this boat at the same speed. Well equipped to run 30 knots at wide open throttle, her Caterpillar 3126's are dialed in and ready to take you offshore. West Florida Yachts would love to guide you through a personal showing of this 40' Ocean Yachts 40 Super Sport 1997. 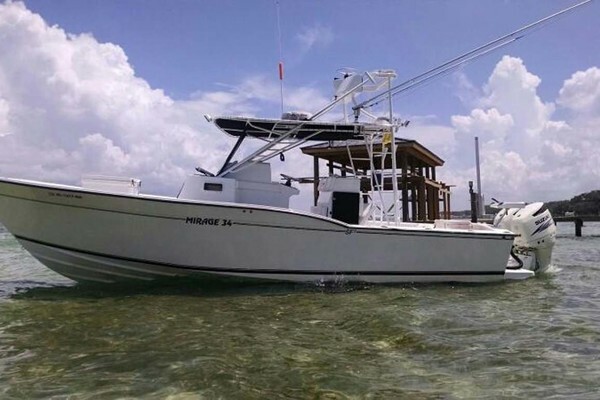 This yacht for sale is located in Lantana , Florida and priced at $159,000. For a showing please contact us by filling out the form on this page and we will get back to you shortly! The 40 Ocean Super Sport offers a large salon with galley up plan to starboard, a large L shaped settee to the port, with hi-lo table as well as a circle dinette forward. The dinette is raised to make excellent headroom for the amidships master below. STARBOARD ENGINE: completely rebuilt,new water pump, heat exchanger and air handlers and aftercooler pressure checked and cleaned, injectors and sleeves replaced,new turbo, new alternator, valve adjustments. PORT ENGINE: heat exchanger, air handler and aftercooler checked and cleaned, head removed and injectors checked, new turbo,new alternator, valve adjustments checked.